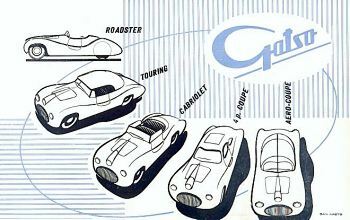 Forerunner of the postwar Gatford and Gatso sportscar. 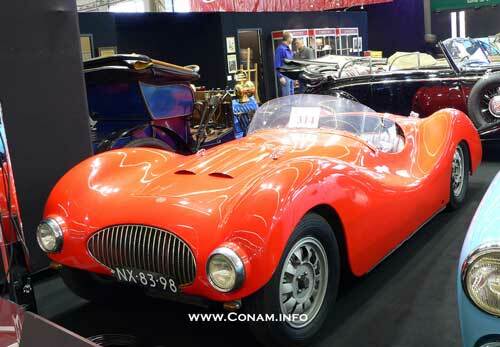 Two-seater, with luxurious red Connolly leather interior. Detachable fabric top. 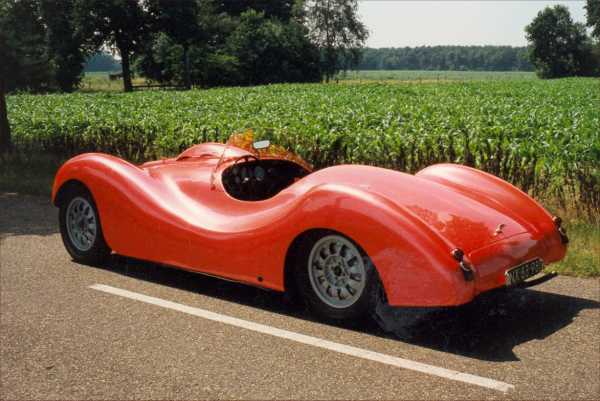 Bodywork custom-built to Maurice Gatsonides’ requirements by Schutter & Van Bakel, Amsterdam. 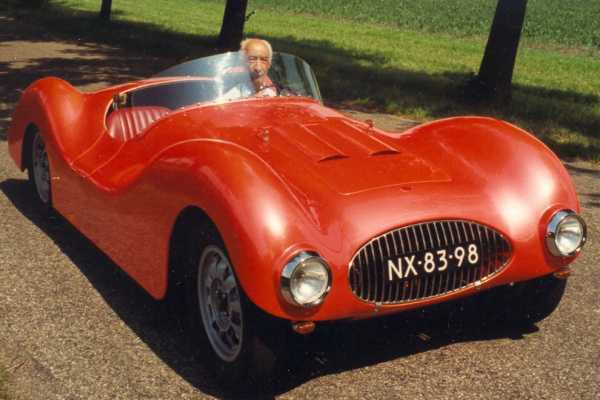 Built on the first Ford Mercury chassis imported into Holland, and therefore featured the enlarged, 3.9 litre 95 b.h.p. V8 engine fitted with high-compression aluminium cylinderheads and two double barrel carburettors. The engine was exclusive to the Mercury line, rather than the regular 3.6 litre 85 b.h.p. Ford V8. With only the “Kwik” (the Dutch word for “mercury”) legend on the body being visible here it is the typical Ford-pattern road wheels which give a clue to the car’s mechanical specification. 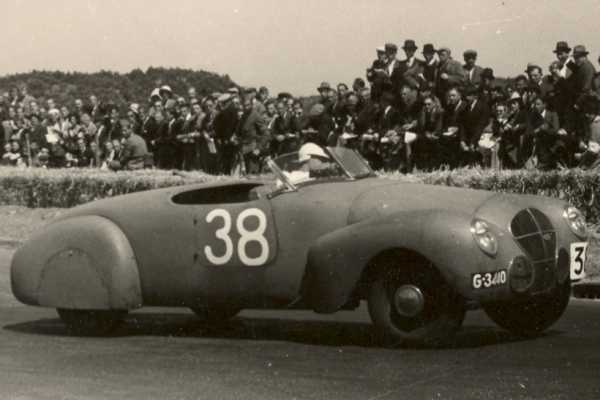 Making its debut in the Prize of Zandvoort 1939 with number 38, a cylinderhead-gasket problem and engine damage from the resultant overheating caused Gatsonides to pull out of the race before the end. Contested the Liège-Rome- Liège Rally in 1939 with number 28. Team : Maurice Gatsonides – Lex Beels. Finished in 14th place. Early 1940 Kwik collided with a truck and a streetcar (tram) in the Dutch village of Lisse. At the end of 2003 Tom Gatsonides, the son of Maurice, became the new proud owner of “Kwik”. The car was a present from the staff of Gatsometer BV the company Maurice started in the late 50’s. 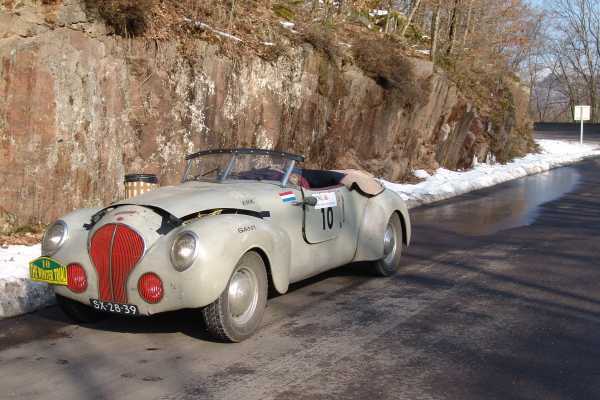 Contested the Winter Trial in februari 2005 with number 10. Team : Tom Gatsonides – Rosalie Gatsonides. 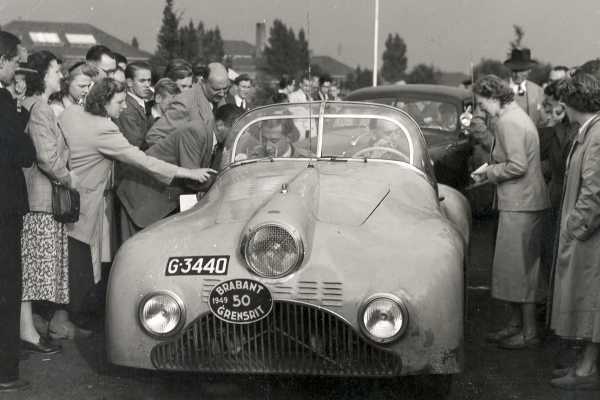 Type: Gatford (Gatsonides-Ford), Year: 1946, Built: 1 pieceBuilt on the chassis of the Ford V8 Roadster in which Maurice Gatsonides and Klaas Barendregt had completed the 1938 Liège-Rome- Liège Rally in 2nd position overall and winner of the unmodified category. 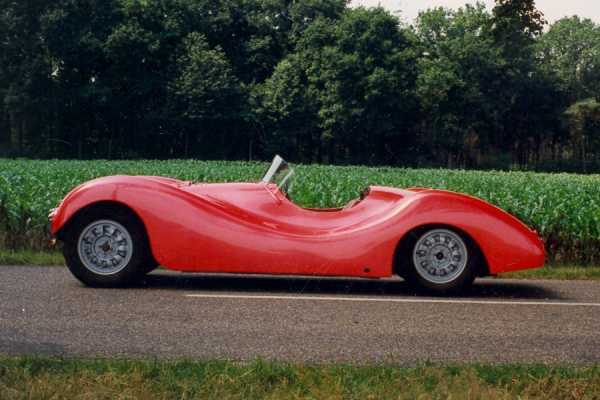 The chassis was suitably modified to reduce height. The standard Roadster’s 3.6 litre V8 S.V. engine was retained at first, but replaced by the larger Ford Mercury 4 litre V8 soon after completion. The same type used in subsequent Gatsonides-built cars. For the Gatford the Mercury engine’s power output was raised from the normal 95 b.h.p. to a figure of 124. 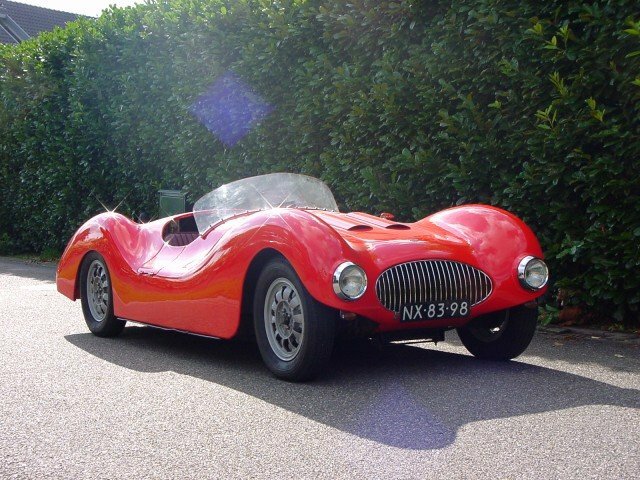 This was achieved principally by using a pair of American tuning expert Eddy Edmunds’ dual carburettors manifold and ribbed aluminium cylinder heads. Of more efficient design, these raised the compression ratio from the normal 6.8 : 1 to 7.5 : 1. Transmitting the power to the rear wheels was the old Ford Roadster’s normal three-speed gearbox and a Columbia two-speed rear-axle assembly. Thus, the Gatford had the benefit of six forward speeds. 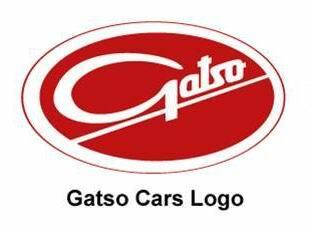 Overall the Gatford could be considered as a Gatso modified Ford. 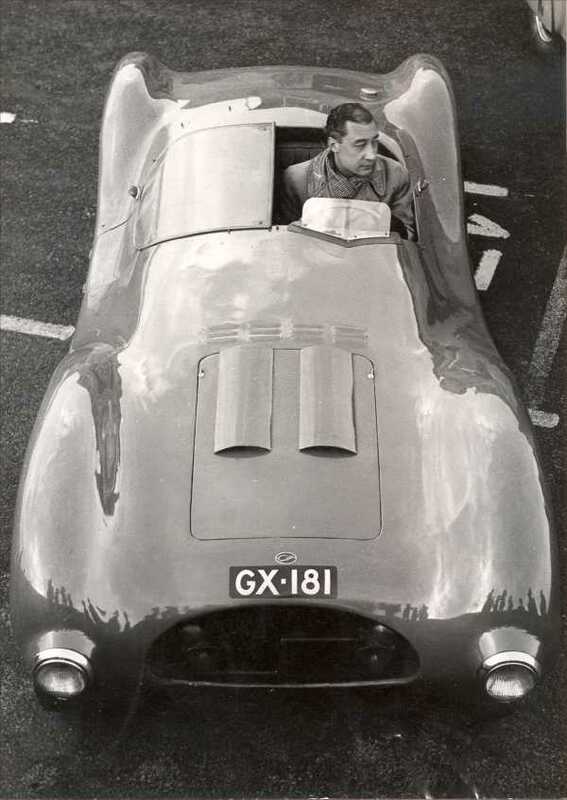 Perhaps the most striking feature however was the third head-light placed centrally above the radiator grille. This had come about due to the need for an extremely low bonnet line at the front of the car, whilst further back needing to clear the carburettors mounted in the V of the V8 engine. 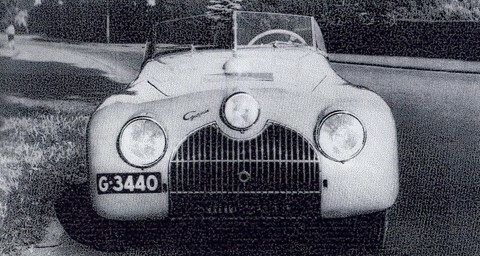 Finished in second place overall on the first postwar staging of the Alpine Rally, July 1946. 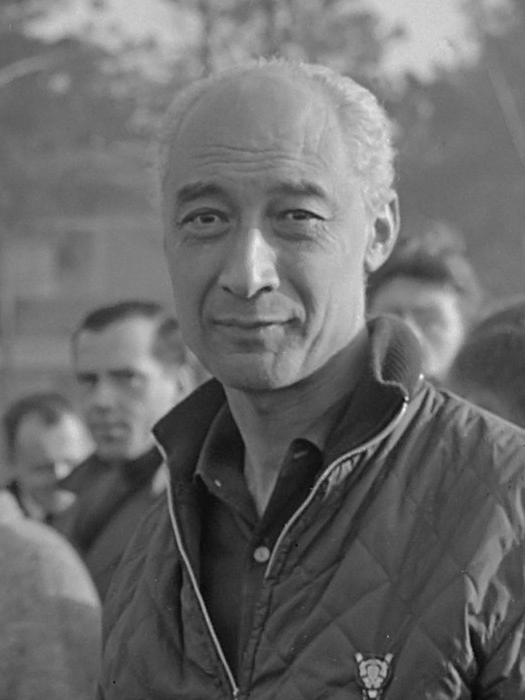 Team : Maurice Gatsonides – Henk Blijdenstein. 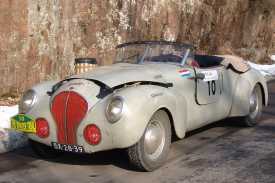 Finished in third place in the Lisbon Rally 1947. Team : Maurice Gatsonides – Theo van Ellinkhuizen. Finished first on the first, postwar, Dutch sportscar race at the Leeuwarden air force base, July 1947. Driver : Maurice Gatsonides. 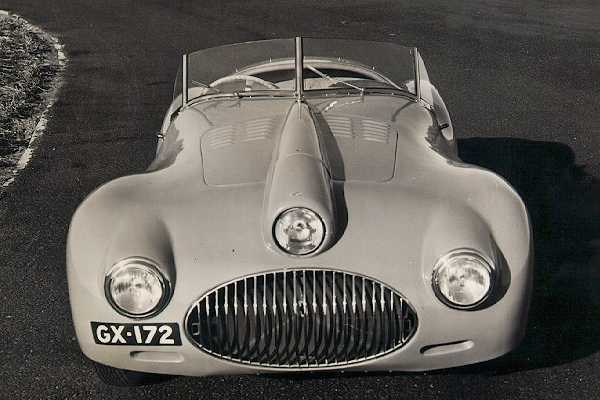 This car was the only one to carry the “Gatford” name script, as the Ford Motor Company felt it sounded too much like “Matford” (the abbreviation of Mathis-Ford), which was Ford’s brandname in France. 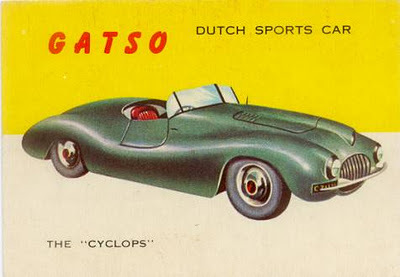 Consequently the remainder of the Heemstede-produced cars bore the name “Gatso” which was of course every bit as appropriate, although, ironically, those later cars were actually built on genuine but lowered Matford “13” (Ford France) chassis with 4″ shorter wheelbase than the American one. 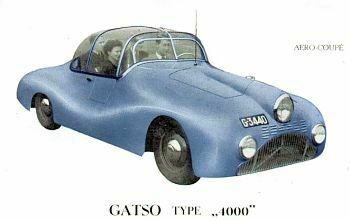 The GATFORD is a fast, comfortable and above all a reliable Sportscar, designed to be driven for a long time at high average speeds. By means of a dual ratio back axle the revolutions of the engine can be kept quite low, which improves its durability considerably while a low petrol consumption is obtained. The car itself is chiefly built from Ford parts, which are obtainable everywhere at reasonable cost. The very light body is built of duraluminium attached to a rigid steel frame. As a result of years of experience gained in all kinds of international competitions, a very good roadholding has been obtained, coupled with remarkable good steering. The driving qualities are only equalled by those of a few high priced European cars. Engine : 120 b.h.p. at 4000 r.p.m. V8 monobloc. Side valves. Aluminium high-compression heads with polished combustion chambers. Two down-draught twin-choke carburettors. Special intake manifold, highly polished. Steel backed main and connecting rod bearings. Full flow oil filter and cooler. Special design camshaft. Bore and stroke 3.187 x 3.75 ins (80.95 x 95.25 mm). Cubic capacity : 239 cub. ins (3917 cc). V8, O.H.V. engine of 175 b.h.p. at 5200 r.p.m. available at extra cost. Cooling system : Pressure radiator. Two waterpumps and a crankshaft-mounted fan. Ignition : Scintilla Vertex magneto. Lodge H.N.P. 14 mm. plugs. Clutch : Single dry plate. Remote control central gear lever or fitted to the steering column optional. Back axle ratios available : 4.55 : 1, 4.44 :1, 4.33 : 1, 4.11 : 1, 3.78 : 1 and 3.54 : 1. Overdrive of 28.5 % in back axle. Suspension : Transverse leaf springs (front and rear) with “Silentbloc” bushes. Anti-roll bar and double acting hydraulic shockabsorbers in front. Hydraulic stabiliser with double acting shockabsorbers at rear. Steering : Left or right hand optional. Two-spoke 17″ (455 mm) diam. steeringwheel. Wheels : 5 Easy-clean steel discs. Second spare wheel complete with tire at extra cost. Tires : 6.00 x 16, 6-ply. Petrol Tank : At rear, 20 Imp. gallons (90 L) capacity. Two spare tanks, contents 7 Imp. gallons (30 L) each, mounted in centre, alongside chassismembers, at extra cost. Electrical equipment : 6 Volt air ventilated dynamo. Constant voltage control. 100 Amp. hrs. battery. Two powerful broad-beam headlamps and one long-beam centre lamp. Rheostatic controlled instrument lights. Dimensions : Wheelbase : 108¼ ins (2.75 m). Track, front : 56 ins (1.42 m). Track, rear : 58 ins (1.47 m). Overall length : 171 ins (4.35 m). Overall width : 66 ins (1.70 m). Ground clearance : 8 ins (0.20 m). Turning circle : 36 ft (5.47 m). Specifications and prices may have to be modified without notice. A tuned 4 litre Mercury V8 engine providing the power. 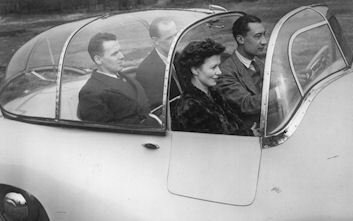 The general styling echoed the original Gatford, but additionally the Aero Coupé featured a sliding clear-plastic canopy reminiscent of a fighter aeroplane and in fact manufactured for Gatsonides by the Fokker aircraft company. Performance : over 100 mph (160km/h), Economy : better than 20 mpg. 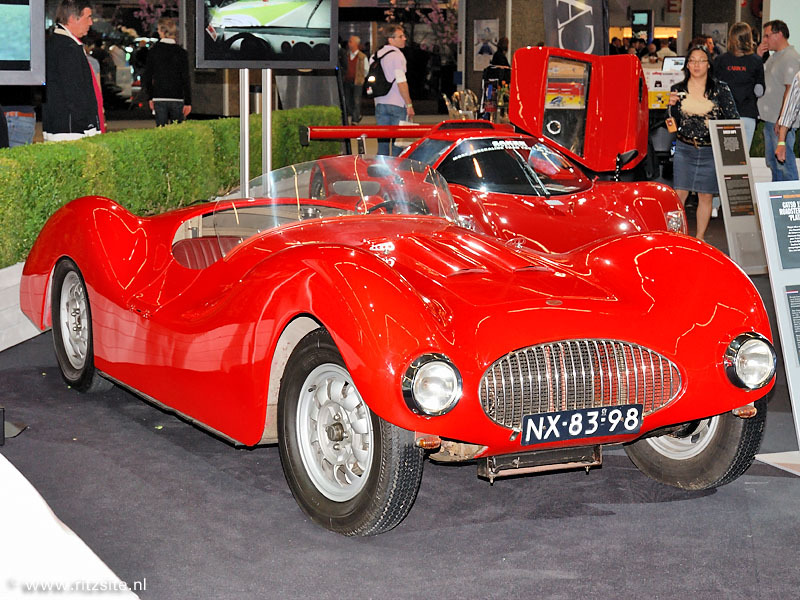 Introduced at the Geneva “Salon de l’Auto” in march 1948 and also showed at Holland’s own first postwar RAI Motor Show in Amsterdam. From the United States came orders for no less than 200 cars. But this was impossible for Gatsonides, who hadn’t really even the financial means with which to continue his business at its modest level. 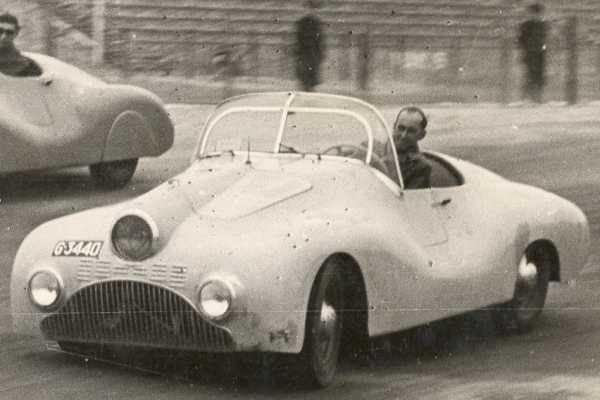 Open two-seater, using the similar chassis and mechanical components as the Aero Coupé (Matford “13” chassis, Mercury V8). 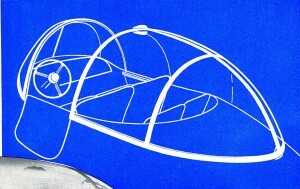 A detachable cloth top with side screens was provided for weather protection. 1 sold (detail : righthand-side steeringwheel) to Félix Endrich of Switzerland, Olympic champion two-men bobsleigh, 1948 Sankt Moritz. 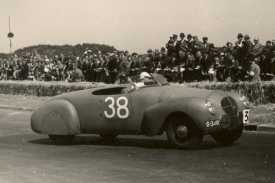 With this car Endrich became Switzerland’s mountain-climb champion. Later in 1948 he was killed in a bob-sleigh accident. 1 sold to Dutchman Aad Tops who emigrated to South-Africa. Tops drove this car to victory in the Lorenzo Marquez Rally. 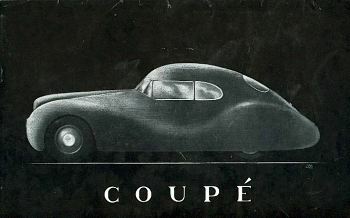 Fixed-head coupé, using the similar chassis and mechanical components as the Aero Coupé (Matford “13” chassis, Mercury V8). Almost identical to the previous Roadsters. Fixed steel hardtops however rather than the removable cloth tops of the earlier twoseaters resulted in these being closed Coupés. Of these one was for Dr. Roberts, a doctor in Sneek (Friesland), whilst the other car belonged to a Mrs. Jochems, a well-known personality in The Hague’s high society. 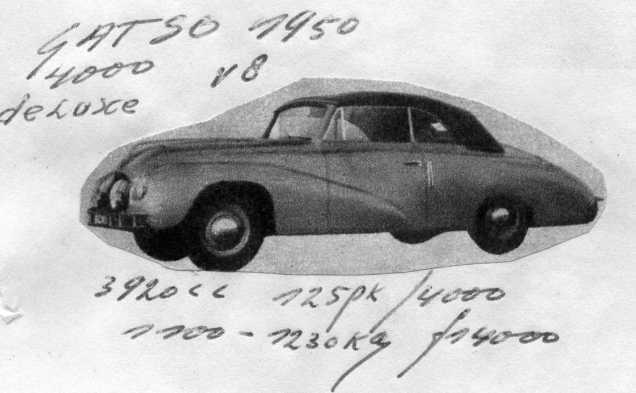 Type: Gatso 4000 2+2 Coupé, Year: 1949 ?, Built: 1 piece ? 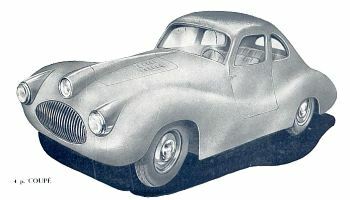 A low-built 2+2 fixed-head coupé, using the similar chassis and mechanical components as the Aero Coupé (Matford “13” chassis, Mercury V8). 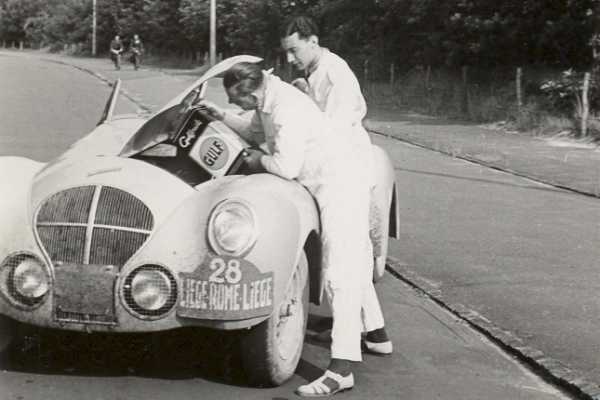 This car was nicknamed “Molehill” due to the curvature of the protruding top, was intended to win the tough 1950 Liège-Rome-Liège rally. Co-driver : Ginet Trasenster (Belgium). 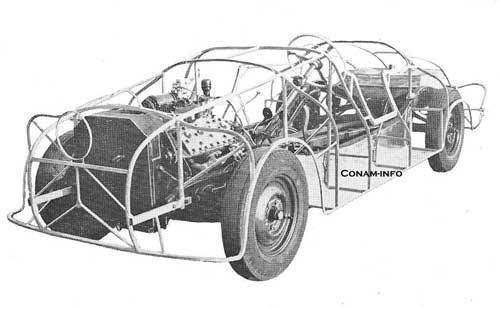 Fiat 1500 chassis (shortened), Fiat 1.5 litre six-cylinder in-line OHV engine, Dubonnet independent front suspension, finned alloy brake drums. 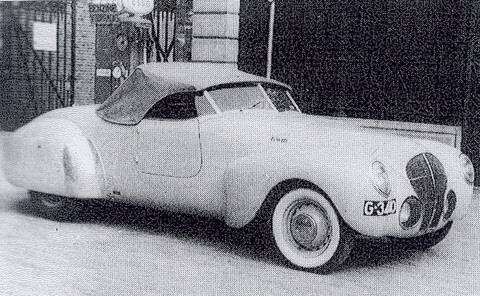 This car didn’t require the bonnet bulge of the Ford based Gatso’s, and so the central lamp was omited. 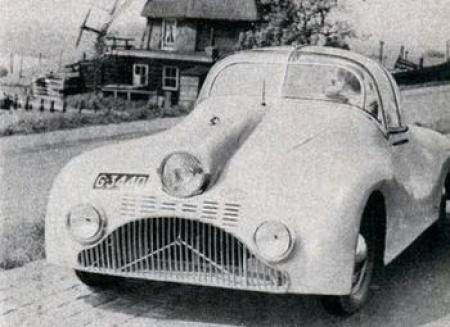 The car was nicknamed “Platje” = “Flatty”. 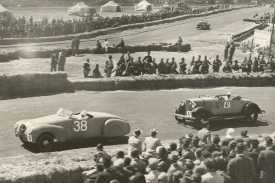 Leading at the National Sportscar Races held at Zandvoort in 1950, a rear wheelrim centre gave away, putting the car and its driver/constructor out of the race. 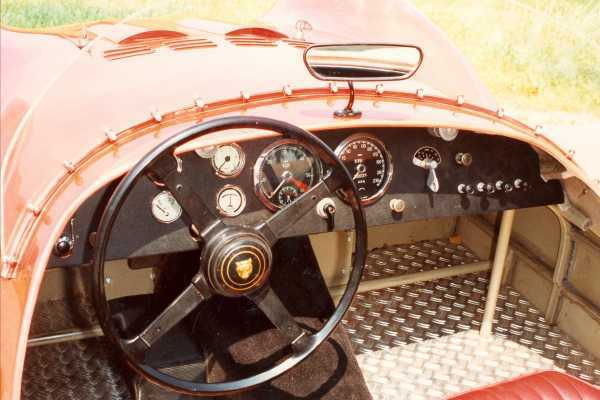 Flatty was equipped with ultra-lightweight wheels specially made in France, which aided the performance of the car whilst also providing better brake cooling. Unfortunately, the one on the left rear failed to stand up to the high cornering forces generated on the Zandvoort circuit. The last and most luxurious Gatso. Built for a Dr. Polano, a well known personality in the The Hague society scene, and was specially designed according to the doctor’s wishes. 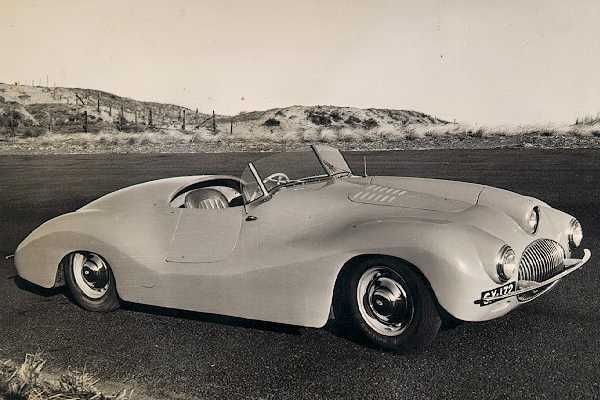 On a modified and longer Ford Mercury chassis and running gear, and with a normal Mercury V8 engine this car was however of more conventional height, being built as a luxury six-seat convertible with a fully-retractable electrically operated soft top. 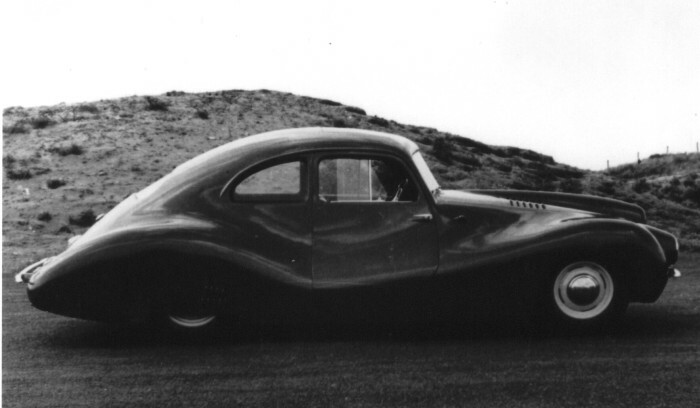 The bodywork in this case was being manufactured by the coachbuilders Boonakker. When bankruptcy was declared, Dr Polano reached an independent agreement, so enabling the car’s completion. 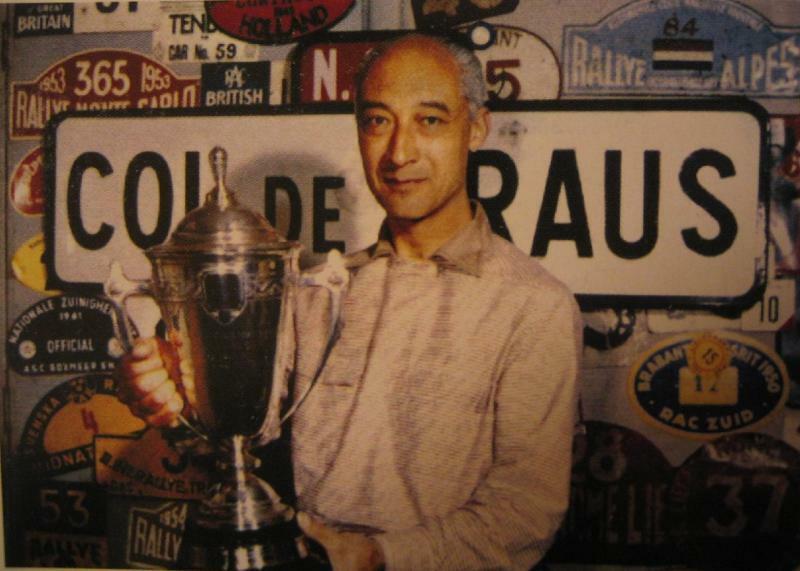 De Nederlandse autocoureur die in 1953 de rallye van Monte Carlo gewonnen heeft, weten zij die zo’n 60 jaar of ouder zijn. Een enkeling vanaf 45 jaar brengt hem direct in verband met de Gatsometer, een uitvinding die iedereen tegenwoordig beter kent als de flitspaal. Dat hij zelf ook auto’s bouwde is wat minder bekend. De op 14 februari 1911 op Java geboren Gatsonides volgde in Nederland de HBS. Bij het eindexamen was hij op één na de beste van zijn klas. Zijn voorliefde voor de techniek, zijn zin in avontuur en romantiek doen hem besluiten na zijn schooltijd bij de luchtmacht te gaan. Een carrière als jachtvlieger bij de luchtmacht, waar hij zijn zinnen op gezet had, zat er helaas voor hem niet in. Na de keuring moest hij zijn handtekening zetten. Pas op dat moment viel het de keuringsartsen op dat hij een vingerkootje miste en werd hij alsnog afgekeurd. Maus ging niet bij de pakken neerzitten en gaat op Schiphol eerst als volontair werken bij de KLM. Dichter dan dat kon hij niet bij het vuur komen. Later komt hij daar in vaste dienst als mecanicien. Deze loopbaan was echter ook niet van lange duur. Na een aantal vliegtuigongelukken in korte tijd weet zijn verloofde hem over te halen de luchtvaart achter zich te laten. Dit viel Gatsonides niet al te zwaar. Met een flinke som geld achter de hand, een erfenis van zijn grootouders, begon hij een autobedrijf in Heemstede. Dit stelde hem in staat tegelijkertijd een andere passie van hem te verwezenlijken, de autosport. Jaren eerder had de jonge Maus Gatsonides al een autosportprijs gewonnen. Bij een behendigheidsrace waarbij het parkoers gemarkeerd was met lege olieblikken was het de listige Gatsonides die er tot ieders ontzetting vandoor ging met de beker. Na de reglementen goed doorgelezen te hebben, verzocht Gatsonides de wedstrijdleiding om als laatste te mogen starten. Toen iedereen het parkoers had afgelegd verscheen hij aan de start. Op volle snelheid werden alle blikken plat gereden of in de berm gekegeld. Zelfs met alle strafseconden die bij zijn eindtijd opgeteld werden was hij veruit de snelste en kon hij van de morrende organisatoren zijn eerste prijs in ontvangst nemen. Vele malen in zijn autosportcarrière heeft hij op soortgelijke kwajongensachtige wijze een race naar zijn hand weten te zetten. Al voor de tweede wereldoorlog had “Gatje”, zoals hij ook wel door zijn vrienden genoemd werd, al deelgenomen aan de diverse grote en minder grote evenementen. Onder andere in de Rallye van Monte Carlo en Luik-Rome-Luik deed hij van zich gelden. Als dealer van Hillman en Riley, was een wagen en onderdelen makkelijk voorhanden. 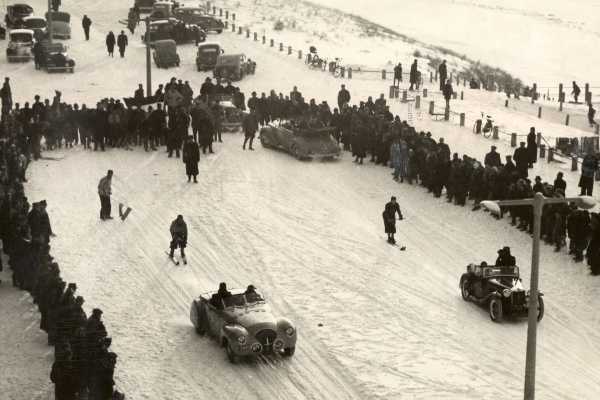 In 1937, de tweede keer dat hij de Rallye van Monte Carlo reed, speelde de equipe Maus Gatsonides – Kees Sanders het klaar om met een Hillman Minx de Barclay’s Bank Cup te winnen. Deze wisseltrofee was voor de hoogst geklasseerde wagen van Britse makelij. Deze cup heeft hij in 1950 en 1953 nogmaals behaald waarna hij de beker definitief mocht behouden. Een andere zeer zware rit dat jaar was Luik-Rome-Luik. 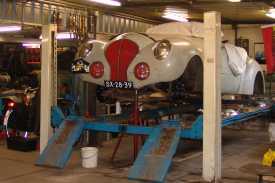 Met zijn Riley type Kestrel Sprite was hij een van de zeven deelnemers die de finish haalden. Dat terwijl er 39 aan de start waren verschenen……..
Het zal duidelijk zijn dat Gatsonides meer bezig was met de autosport dan met het runnen van een automobielbedrijf. Het gevolg was dat in 1938 zijn bedrijf failliet ging. Het familiekapitaal was als sneeuw voor de zon verdwenen en de wens om professioneel wedstrijdrijder te worden was nog steeds niet in vervulling gegaan. Zijn bekendheid als wedstrijdrijder kwam hem goed van pas tijdens een sollicitatie bij Ford Nederland. Bij dit bedrijf was hij werkzaam als servicetechnicus. Verder maakte Ford het hem mogelijk om met wagens van dat merk uit te blijven komen in wedstrijden. 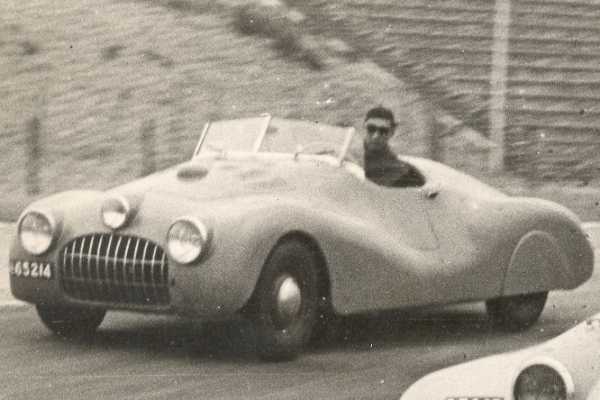 Zo verscheen hij samen met Klaas Barendregt aan de start van de 1938 Luik-Rome-Luik en 1939 Monte Carlo in een Ford V8. Nu hij als fabrieksrijder voor Ford zijn grote passie kon blijven voortzetten, koesterde Gatsonides alweer een nieuwe ambitie. Het bouwen van zijn eigen sportwagens. In Haarlem had hij een pandje gehuurd waar hij zijn wagens kon prepareren. Het was daar waar zijn eerste schepping het levenslicht zag. Gebouwd op het chassis van de eerste in Nederland geïmporteerde Ford Mercury met een 3.9 liter V8 motor. Deze motor was exclusief voor de Mercury, de standaard Ford V8 motoren hadden een inhoud van slechts 3,6 liter. Verder was de motor voorzien van hoge compressie aluminium cilinderkoppen en twee dubbele carburateurs. Afgezien van de benaming “Kwik” (het Nederlandse woord voor Mercury) aan weerszijden van de auto wees niets er aan de buitenkant op dat het origineel een Ford betrof. 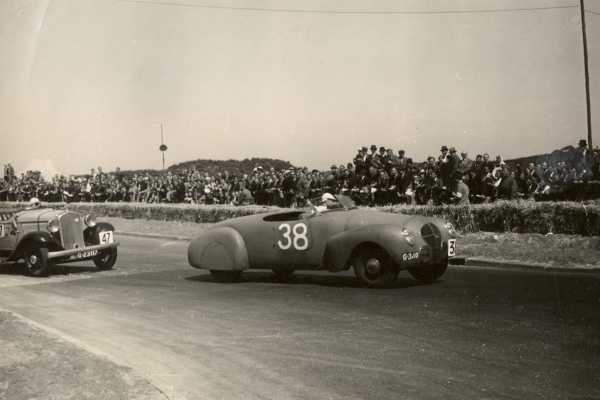 Het eerste optreden van Kwik was op 3 juni 1939 tijdens de allereerste prijs van Zandvoort, toen nog op een stratencircuit. presteerde Kwik met de equipe Maus Gatsonides – Lex Beels een stuk beter en behaalden zij een 14de plaats. Gatsonides, altijd in voor een lolletje, nam met Kwik ook deel aan wat minder serieuze wedstrijden. Zo waren skiwedstrijden achter de auto in die vooroorlogse jaren tamelijk populair. Dit was zoiets als waterskien maar dan op de sneeuw achter een auto. Zo was er in januari 1940 zo’n wedstrijd op de noord-boulevard in Zandvoort. Als het om competitie ging, dan ging Maus ook voor de eerste plaats. Tijdens de laatste manche zette hij de snelste tijd neer. Min of meer tot ongenoegen van zijn vriend Ernst van Hasselt die achter Kwik op zijn buik de finish passeerde. 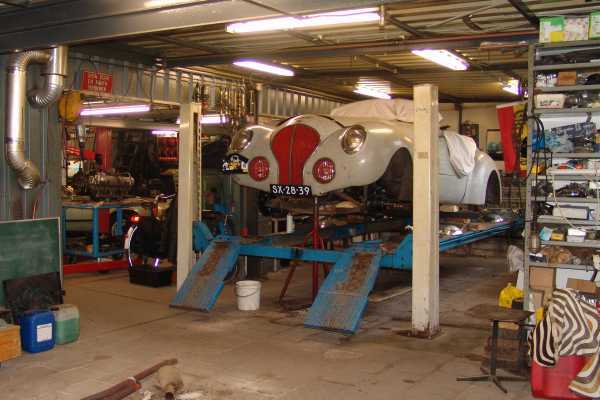 Toen een paar maanden later de tweede wereldoorlog uitbrak kwam er onverwacht een voorlopig einde aan Gatso’s plannen om sportauto’s te gaan ontwerpen en bouwen. Het zal niemand verbazen dat het gedurende deze donkere dagen ook de racerij niet meer mogelijk was. Na de inval van de Duitsers werd alle benzine door de bezetter gevorderd. Ook het normale autoverkeer was tot een halt gekomen. Hoewel er lieden waren die dachten dat Hitler binnen niet al te lange tijd zijn biezen zou pakken, dacht Gatsonides daar anders toch over. Enkele weken na de inval van de Duitsers reed Gatso al weer rond in een van zijn laatste centen omgebouwde auto voorzien van een door hem zelfbedachte en ingebouwde gasgenerator. Nu was het principe van hout- of kolenvergassing niet onbekend maar op deze manier was het nog niet eerder toegepast. Menig automobilist in die tijd zou graag weer mobiel willen zijn maar de ingrijpende aanpassingen aan hun kostbare automobielen weerhielden hen ervan om ook een gasgenerator in te laten bouwen. Gatso onderkende dit en bedacht een gasgenerator in de vorm van een aanhanger achter de auto zodat de aanpassingen aan het voertuig zelf tot een minimum beperkt konden blijven. Helaas ontbrak hem het geld om het idee in productie te gaan nemen. Door zijn enthousiasme wist Gatsonides uiteindelijk Lex van Strien warm te maken voor zijn plannen. Lex van Strien kon als Forddealer een aantal grote bedrijven tot zijn klantenkring rekenen. Van Strien zegde voor een jaar zijn financiële medewerking toe en leverde tevens twee monteurs. Stork Apparatenfabriek in Amsterdam zorgde voor de uiteindelijke serieproductie. Na dat eerste jaar waren onder meer wagens van het Provinciaal Energiebedrijf Noord-Holland, Publieke Werken van Zandvoort en Vroom & Dreesman uitgerust met een Gatsonides Gasgenerator en stond Gatso aan het roer van een florerend bedrijf met uiteindelijk zo’n 25 mensen op de loonlijst. In afwachting van betere tijden koesterde Gatsonides nog steeds het plan om zelf sportwagens te bouwen. In zijn weinige vrije tijd schetste hij de wagens zoals hij die voor ogen had. 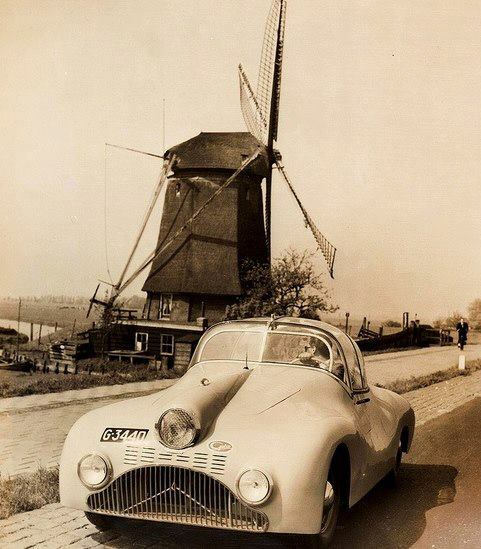 De stroomlijn van de carrosserie was duidelijk geïnspireerd door de Duitse Auto Union Wanderer Streamline Special waarvan er een aantal aan de start verschenen waren tijdens Luik-Rome-Luik van 1939. Reeds voor het einde van de oorlog waren er een aantal schaalmodellen van de toekomstige “Gatford” gemaakt en getest in de windtunnel van het Nationaal Luchtvaartlaboratorium te Amsterdam. Na de capitulatie had het bedrijf Gatsonides Gasgenerator Service geen bestaansrecht meer en begon Maus in Heemstede met een twintigtal monteurs het autobedrijf “Allround Service”. In eerste instantie was het bedrijf gericht op het weer rijklaar maken van voertuigen die voor de bezetter verborgen waren geweest. 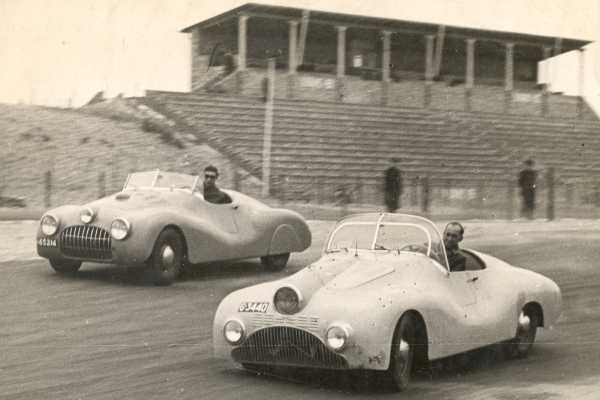 Zo kwam voor Gatsonides zelf het chassis en motor van de Ford V8 waarin hij samen met Klaas Barendregt in 1938 Luik-Rome-Luik gereden had weer tevoorschijn en begon hij met de bouw van de eerste Gatford. Het chassis werd aangepast en verlaagd. Aanvankelijk werd de originele 3,6 liter V8 zijklepmotor gebruikt. Deze werd al snel vervangen door de 3,9 liter Mercury motor waarvan het vermogen opgevoerd werd van 95 pk naar 124 pk met behulp van een Eddy Edmunds opvoerset met aluminium cilinderkoppen waardoor de compressieverhouding verhoogd werd van 6,8 : 1 naar 7,5 : 1. Dezelfde motor configuratie werd gebruikt in de latere Gatso auto’s. Verder werd een achteras met dubbele overbrenging aangebracht waardoor het aantal versnellingen van drie naar zes verdubbeld werd. Het meest in het oog springende detail van de Gatford was de derde koplamp in het midden van de radiatorgril. Deze verstraler was in die dagen toen de straatverlichting nog niet zo was als tegenwoordig geen overbodige luxe. Ten behoeve van de dubbele valstroom carburateurs die ver boven de motor uitstaken kwam er een bult op de lage motorkap. Bij de latere Gatso’s werd deze bult mooi weggewerkt door in het verlengde van de middelste koplamp de motorkap enigszins verhoogt door te laten lopen. 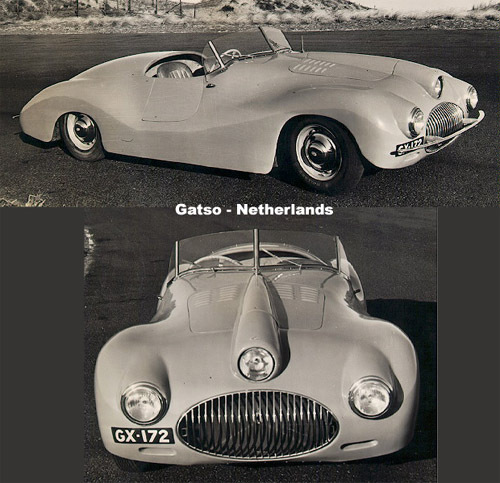 Op de foto: links de Gatford met de bobbel op de motorkap, rechts de Gatso 4000 Aero Coupé zonder de perspex kap waarbij de bobbel elegant is weggewerkt. De wagen presteerde uitstekend in de eerste naoorlogse autoraces. 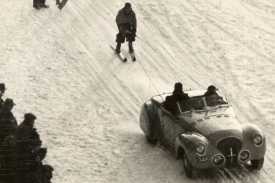 Tweede in de Alpenrallye 1946, derde in de rallye van het Iberisch Schiereiland 1947 en eerste tijdens de eerste Nederlandse sportwagenraces op vliegbasis Leeuwarden in 1947. Dit was overigens de enige wagen die de merknaam Gatford voerde. Ford maakte hier namelijk bezwaar tegen omdat de naam teveel klonk als Matford, een samentrekking van Mathis-Ford, de merknaam waarmee Ford actief was in Frankrijk. Door het succes van de eerste wagen ging Gatsonides zich meer en meer toeleggen op het ontwerpen en bouwen van zijn eigen auto’s. 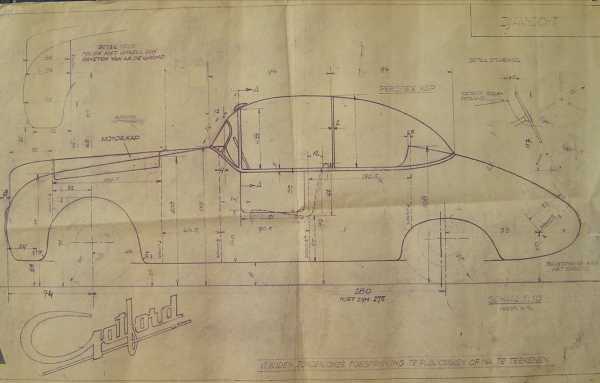 Ironie wil dat deze wagens gebouwd werden op een verlaagd Matford “13” chassis welk zo’n 10 centimeter korter was dan het Amerikaanse Ford chassis. 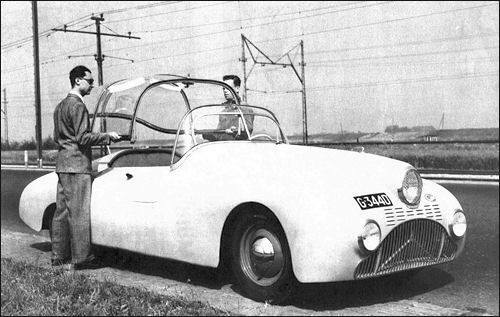 Eindelijk in 1948 zag de Gatso 4000 Aero Coupé het levenslicht. Overal waar de wagen kwam trok deze veel bekijks. 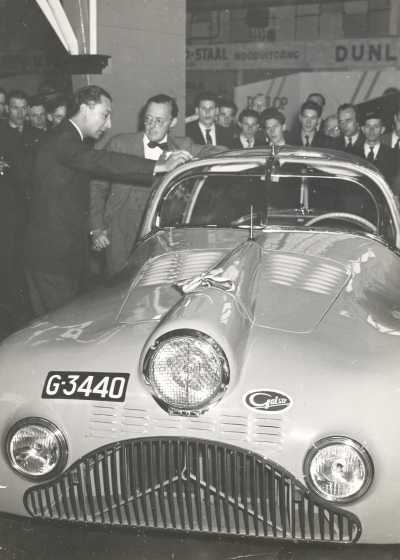 Zo ook op de eerste na oorlogse Auto RAI 1948 waar Prins Bernard grote belangstelling toont voor de Gatso 4000 Aero Coupé. Dit was vooral te danken aan de door Fokker vervaardigde perspex kap. Het spectaculaire uiterlijk van de wagen leverde Gatsonides een Amerikaanse order op voor 200 stuks. Echter de financiële middelen ontbraken om dit project tot uitvoer te brengen. Als gevolg van de publiciteit rond de Aero Coupé werden er wel twee Gatso 4000 Roadsters besteld. 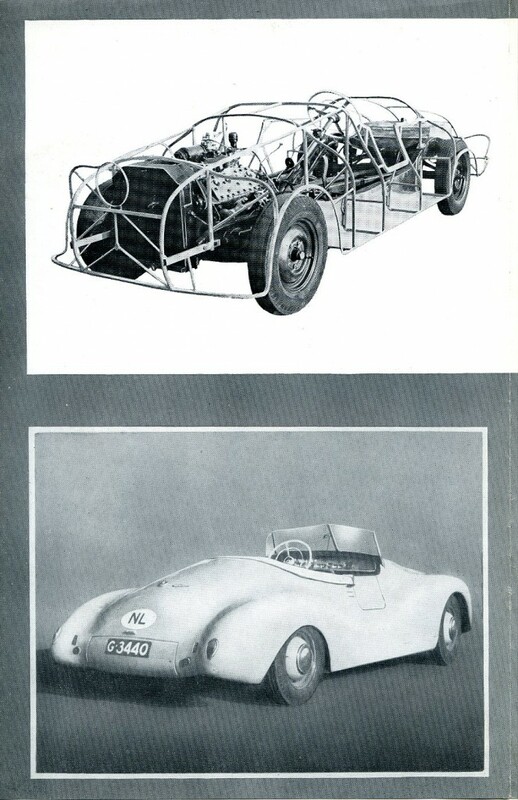 Deze waren mechanisch en motorisch nagenoeg gelijk aan de Aero Coupé zij het dat de roadster een tweezitter was met een afneembare linnen kap. Beide Gatso Roadsters gingen naar het buitenland waar de respectievelijke eigenaren met de wagens nog wat sportieve prestaties hebben behaald. Verder werden er op bestelling nog twee tweezitters gebouwd met een vast dak, de Gatso 4000 Coupé. Vervolgens zag ook nog een vierpersoons uitvoering het levenslicht, de Gatso 4000 2+2p Coupé. In de volksmond werd deze wagen al snel “de molshoop” genoemd. Met deze wagen verscheen de equipe Gatsonides-Trasenter als gedoodverfde winnaar met nummer 1 aan de start van Luik-Rome-Luik van 1950. Wegens een opgeblazen koppakking haalde Gatso de finish niet. Dit was overigens niet het enige dat tegenzat. Doordat Gatsonides al zijn tijd en energie in het bouwen van auto’s stak verwaarloosde hij zijn garagebedrijf “Allround Service”. De klanten liepen weg. De zelfgebouwde auto’s werden verkocht tegen een prijs waarbij alleen in het geval van serieproductie van enige winst sprake kon zijn. Uiteindelijk was het geld op en werd wederom faillissement aangevraagd. Ten tijde van het faillissement stond het meest luxueuze model reeds op stapel, de Gatso 4000 luxe. Deze op specificatie van de klant te bouwen zespersoons cabriolet kon dank zij een financiële regeling afgebouwd worden. In tegenstelling tot de andere Ford gebaseerde Gatso’s ontbrak bij deze cabriolet de centraal geplaatste verstraler. Tussendoor was in 1949 nog een andere wagen gebouwd. Dit keer niet met de Mercury krachtbron maar met een Fiat 1500cc zescilinder. Het chassis was overigens ook van Fiat. Door de geringe hoogte van de wagen ging deze al snel onder de naam “Platje” door het leven. Doordat hier de hoge carburateurs niet aanwezig waren ontbrak ook hier de derde koplamp. Platje heeft menig succes gekend. Desondanks waren er ook tegenslagen. Tijdens sportwagenraces op het circuit van Zandvoort lag Platje aan de leiding toen een lichtmetalen velg, voor die tijd een nieuwigheid, afbrak. 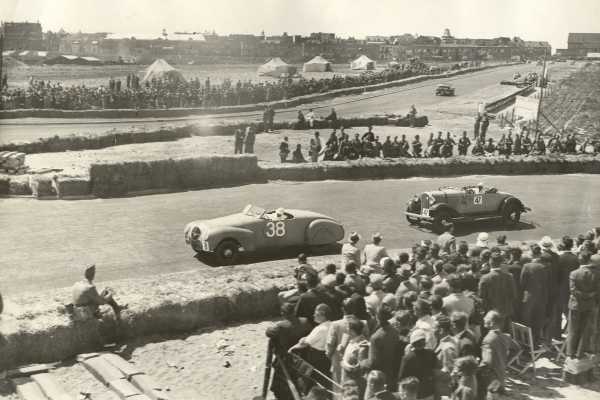 In november 1949 organiseerde de KNAC de eerste uurrecords op het circuit van Zandvoort. Het idee was in eerste instantie afkomstig van de slimme Gatsonides die hierin een gelegenheid zag zijn producten te promoten. De recordpogingen werden voor Gatje automatisch een succes daar elke tijd die gereden werd een record was. Helaas kwam zoals gezegd een jaar later het einde aan de bouw van de Gatso’s. Gatsonides had zich er bij neergelegd maar ging niet bij de pakken neerzitten. In 1952 was hij technisch adviseur en fabrieksrijder bij Ford Engeland. 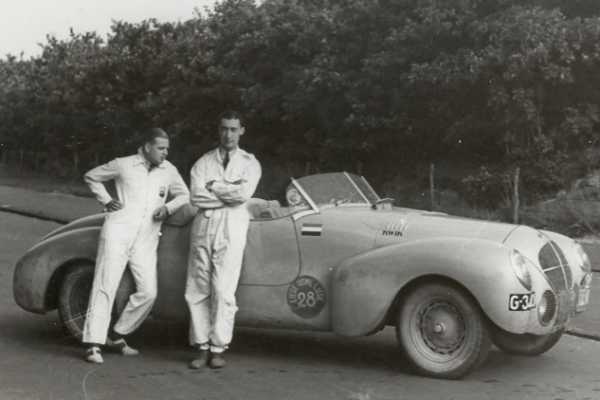 Zonder financieel risico kon hij naar hartelust de autosport beoefenen met als absolute hoogtepunt de zege in de rallye van Monte Carlo van 1953 met een Ford Zephyr. Tot begin jaren 70 heeft hij als beroepsrijder met diverse auto’s deelgenomen aan vele andere evenementen van naam. Voor eigen gebruik knutselde Gatso zijn eigen tijdmeetinstrumenten in elkaar en ontdekte weer een gat in de markt. Met zijn lijfspreuk “Alles kan” startte hij in 1958 weer een bedrijfje, ditmaal in apparatuur voor tijdwaarneming. Een hele bekende zijn de aantikplaten bij zwemwedstrijden. Zo werd door het bedrijf Gatsometer tijdens de Olympische spelen van 1972 in München de tijdwaarneming verzorgd. Dit systeem werkte met rubberslangetjes en pneumatische schakelaars. Voortbordurend op dit thema ontstond de snelheidsmeter met slangetjes over de weg om snelheidsovertredingen vast te leggen. Inmiddels is dit bedrijf uitgegroeid tot wereldwijd marktleider van de door velen verguisde flitspalen en aanverwante zaken. Maar dat is een heel ander verhaal. Het moge duidelijk zijn dat Maurice Gatsonides zijn sporen in de geschiedenis heeft achtergelaten. Van de auto’s zijn er voor zover bekend slechts twee bewaard gebleven. Het gerucht gaat dat er in Zuid-Afrika nog een zou moeten zijn. Naspeuringen hebben echter geen resultaat opgeleverd. Platje is gerestaureerd en eigendom van de heer Bruggeman. Kwik, de allereerste Gatso, is weer in bezit van de familie Gatsonides. Met minimaal sleutelwerk is Kwik weer rijklaar gemaakt voor deelname aan de Wintertrial van begin 2005. Op de foto staat de motorkap op een kier omdat de motor tijdens de Wintertrail geregeld last had van vapour lock.